This is just another one of those simple weeknight pasta tosses that comes together in no time. And this particular one? It's really, really good. The peppers and chipotle marinade provide just the right amount of heat, and the sour cream balances the spice perfectly. I amended the recipe slightly, but I've linked to the original. We love Mexican food in our house, so I pretty much knew from the get-go that this dish would be a hit. I topped our servings with some shredded cheese (to me, a fajita isn't a fajita without cheese!) and some extra sour cream. This is definitely one that I'll make again! 2. Meanwhile, in a bowl combine sour cream, marinade, lime juice, chili powder, and cumin; set aside. 3. In large skillet, add 1 tablespoon of olive oil and cook chicken over medium-high heat until no longer pink. Remove from skillet. Add remaining olive oil and onion, sweet pepper, and Anaheim pepper. Cook and stir over medium heat for 4 to 5 minutes or until crisp-tender. 4. Add chicken, vegetables, and sour cream mixture to drained pasta. Toss to coat. Heat through over low heat. Ive never thought of making fajitas into pasta - what a great and creative idea! I will be trying this one for sure! 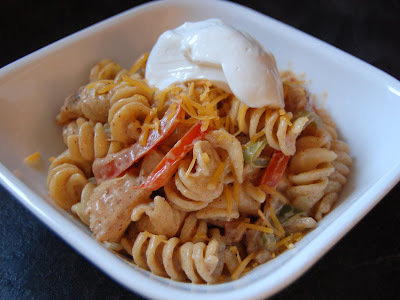 Fajita pasta sounds terrific! Yes, definitely needs the cheese. Would this be good without the sour cream?